Now I know why the dang thing leaked! Rust, rust, everywhere. My 73 SS did not leak untill the headliner was replaced. Then it started to leak right behind the rear view mirror. when i took off the plastic to see what was going on, I found the flakey scale rust there! Mine had been sitting outside dormant for ten years or so. POR 15 is the cure after de-scaling it and/or replacing the metal if it is too far gone! They tucked the headliner into the windshield, the back-glass & up into the door glass channel too. If you have a car w/ a vinyl top- that made it's way in there too. No wonder these cars leak so bad. Your metal actually looks pretty good around there. I Like the Por15 as well & it works. Did you use the 3M window ribbon or just windshield sealant? Actually, they just glued the headliner around the perimeter and covered the untrimmed edges with the headliner plastic trims...at least on all the "A" bodies I've pulled headliners down from. My Cougar, however, has the headliner tucked behind the glass (front and back) and it's going to probably require removal of both to replace it (probably why I haven't tackled that project!). Mine was in the channels front & back as was the vinyl top & where it met the roof rails. Maybe not all are like that but mine was. Perhaps a built in Baltimore thing (maybe a Friday PM or Monday AM shift). Yeah...that's weird! Your car must have gotten the deluxe treatment! Wouldn't have been replaced somewhere along the line, would it? I've pulled no fewer than a dozen of them from various "A" bodies and they were all glued around the edges rather than tucked. It was glued & tucked. I have not removed the front glass yet but I can still see some pieces going into the channel from the inside. There was about 1/4" of material folded into the back glass top channel & up under the roof rails too. I don't think it was ever repaired or replaced but who knows for sure. Kinda strange...my Malibu wasn't put together like that. The windshield seal, the round bead type, worked good on my Elco project, but just to make sure the dam thing never develops a leaky seal, I ran a bead of clear sealant along the edge of the glass, all the way around. Did the same on the rear glass. 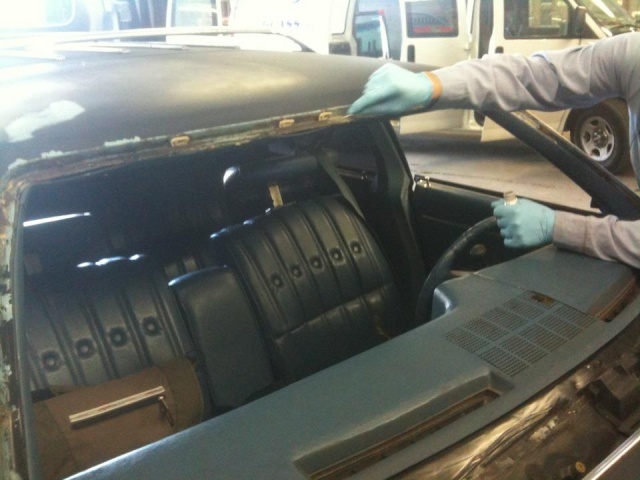 The rear glass is original, the windshield is new. Hope you can get that glass channel cleaned up OK and get some POR on it. Lots of work, been there !! 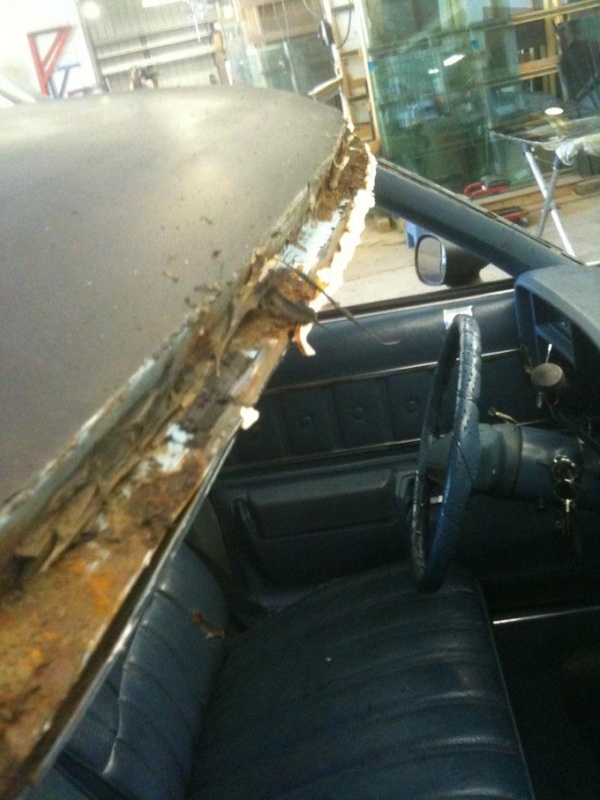 The technician who installed the windshield did put some type of rust neutralizing sealant all around the channel. 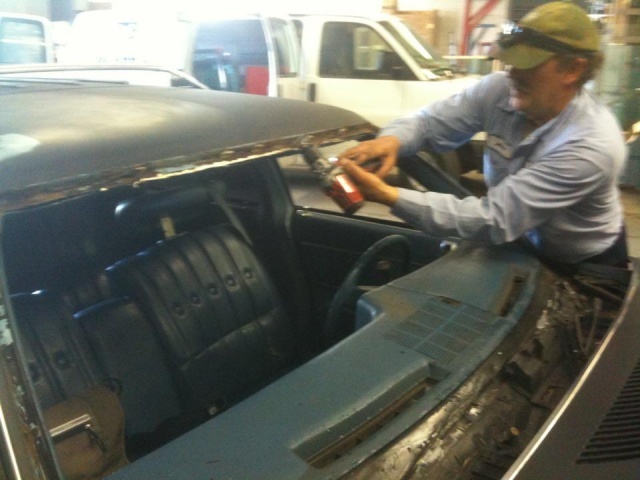 He ground off the rust, put in the sealant and then squirted in the black rubber windshield seal. I figure it's good for many more years, as she's not going to see much rain. » WHO'S GOT JUST REPLACEMENT BULBS IN THERE RHINO???? » Todd Eldredge has hip replacement surgery!